The Bangladesh Agriculture Ministry says it hopes to release a type of genetically modified rice to farmers if on-going research is successful. Authorities claim the new rice may help feed Bangladesh's growing population as well as tackle certain common ailments associated with malnutrition. The Agriculture Minister says the government does not object to GM technology, which may prove beneficial. Research into the crop is being carried out at the Rice Research Institute. Bangladesh's population now stands at nearly 150 million, making it the most densely populated in the world. But agriculture experts say the country is losing 80,000 hectares of land to industrialisation and urbanisation each year. Bangladesh has already produced a hybrid rice and signed agreements with Vietnam and China to share information of this particular rice technology. But officials say the country will now look at genetically modified rice to boost production. The chief of the Bangladesh Rice Research Institute, Dr Mahidul Haque, said a locally developed rice variety known as BRRI 29 has been transformed into a genetically modified rice. He said beta carotene - which the body develops into Vitamin A - had been taken from daffodils and added to the rice. This made it useful in fighting conditions such as poor sight and blindness. Environmentalists and health experts have already warned the government against introducing any GM rice and food in Bangladesh without testing. 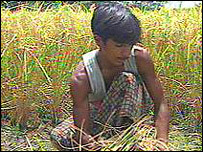 They fear that any GM food without proper testing could create severe health problems in a poor country like Bangladesh. The Agriculture Minister, MK Anwar, acknowledged GM foods are controversial worldwide, but his government will not take any stand against the technology. "We'll introduce GM rice in Bangladesh after proper testing and going through the national and international rules and regulations," he told the BBC. Officials expect the research on GM rice to be completed shortly, but no time-frame has been given.